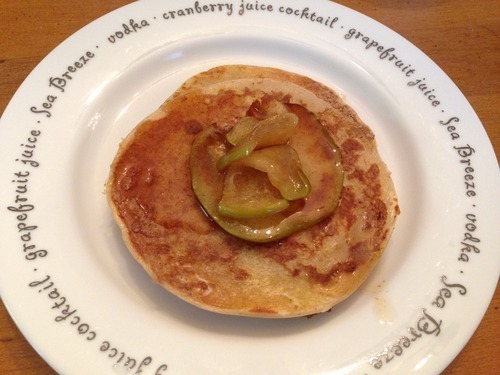 So, these aren’t really “lazy” pancakes per se, but I’m having a lazy day thus making these lazy day pancakes…Anyway, I saw a recipe for Applesauce Pancakes in the new issue of Martha Stewart and I decided to roll with it. Part of the appeal of the Martha pancakes (we’re on a first-name basis)was her recipe for homemade Pink Applesauce, but again, since I was being lazy and I conveniently had 1 container of Mott’s apple sauce in my fridge, that’s what I used. I also left out the sour cream that Martha recommends you serve the pancakes with because (1) I didn’t have any sour cream and (2) I don’t like sour cream…In any case, I do think you should try the pancakes with sour cream if you like sour cream because I can totally envision (is there a word for that with taste? like entaste?) how those flavors would be awesome together. 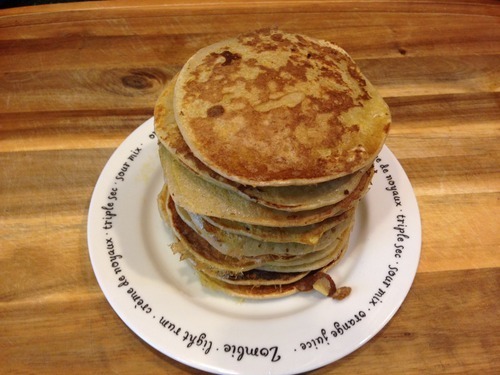 Enough of my making excuses for being lazy…These pancakes were awesome. They’re lightly sweet and apple-y, with a hint of butteriness. They’re easy to make, they don’t need any toppings (although basically anything would be good on them), and they’re basically awesome. 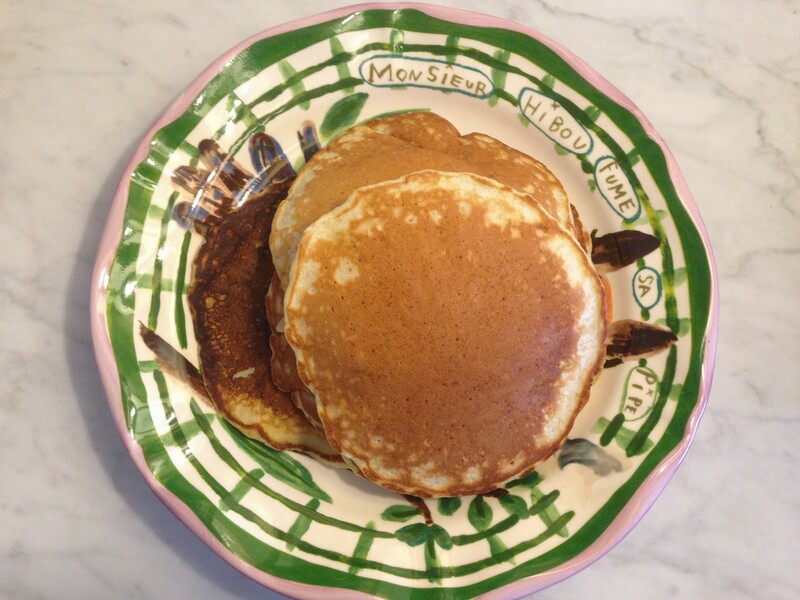 So yeah, bow to these pancakes and then eat all of them. ALL THE PANCAKES. 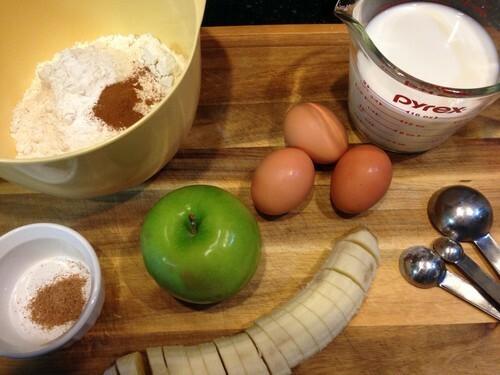 In a large bowl, whisk together all the ingredients. Heat a nonstick pan over medium heat. Add a little bit of oil, just enough to lightly coat the pan (the butter in the batter will make up for the rest). 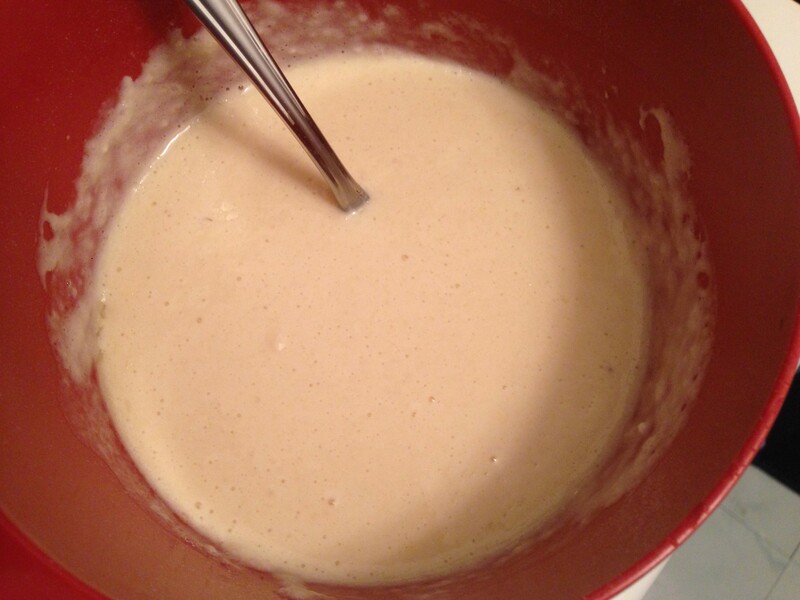 Cook a ladleful of batter at a time (about 1/3 C batter) for 3-4 minutes. Flip and cook for another 2 minutes. 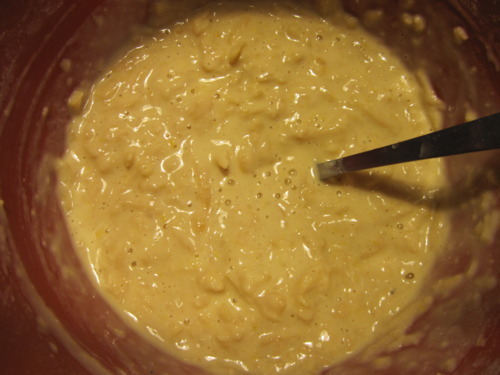 Finish cooking the rest of the batter and enjoy! (but make sure you say it like this) Also, check out the post I worked off of from Four Pounds Flour and take a look at my Recipe Box. 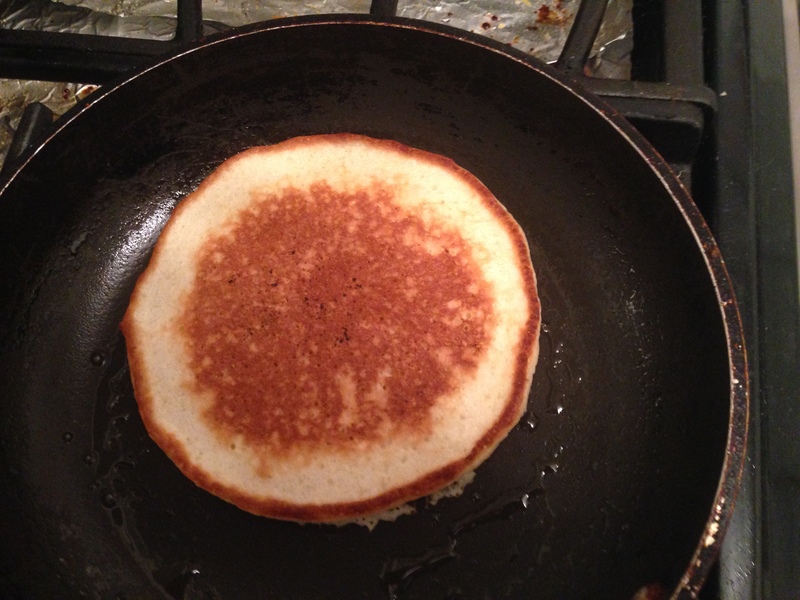 This pancake (pancakes, actually, because I made 2!!) are bangin’ to say the least. To say the most (or just more), they’re warm, gooey, cinnamon-y, apple-y, fried dough-y, pancakes of awesomeness. This pancake is basically the love child (much beloved child) of apple pie and funnel cake, which, let’s be frank, can be resisted by no one. Making the pancakes is a little bit tricky, you have to let the apples marinate for 24 hours (I only did 8) and the pancake flip is definitely an expert-level technique. 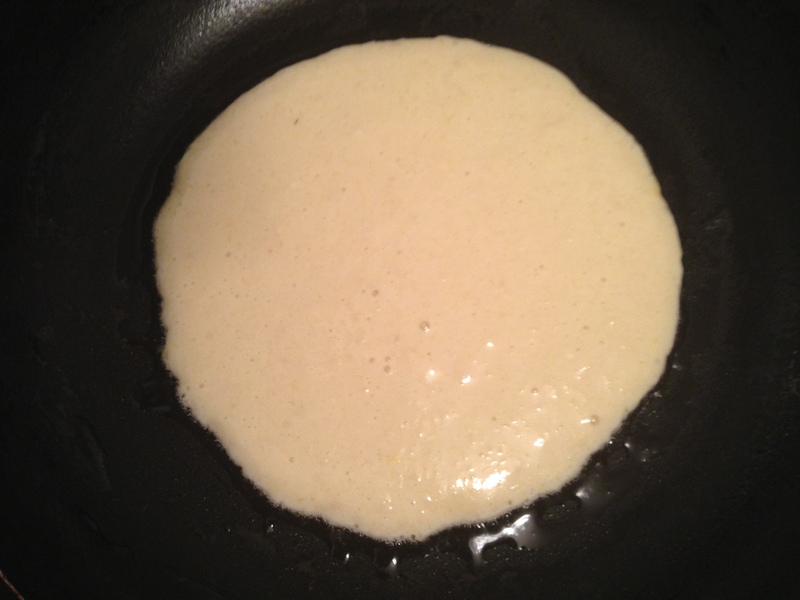 I actually cheated and flipped the pancake onto a plate and slid it back into the pan…the video at Four Pounds Flour is a really good example of what to do, though. Whatever your skill level, though, these pancakes are worth it, so suit up and get in the kitchen! 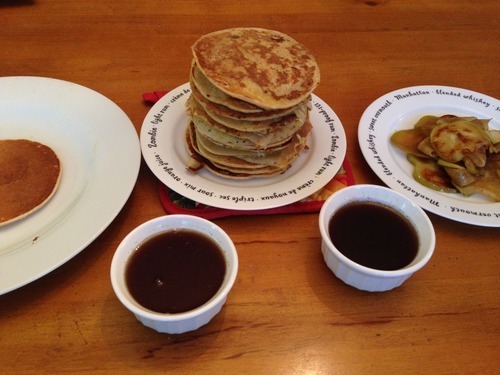 Oh, definitely dive into these pancakes hungry because they are a bit of a gut-buster – in the best way possible. Major disclaimer, these sound way better than they actually turned out. If you’re still interested, read on, check out the original, and see what I did over at my recipe box. I have to admit, I was instantly smitten with the idea. Pancakes turned into French toast? I love both, sign me up! 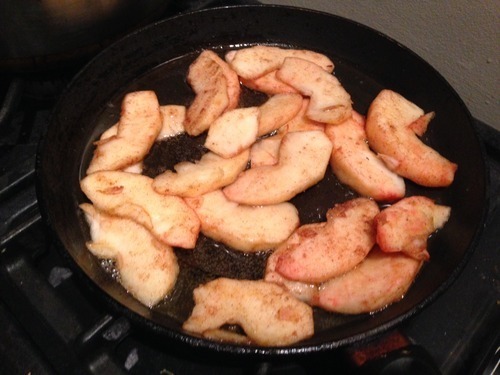 Plus, this recipe also makes a pretty awesome apple-cinnamon-maple syrup. I’ll start with the positive parts of the review. Even though it seems like there’s a lot going on with the recipe, it’s actually pretty simple, just take things step by step. Also, like I mentioned before, the apple cinnamon syrup is GOOD. Apple-y and cinnamon-y and definitely worth saving. And now for the not so great parts. Frankly, it was the pancakes. I tasted them on their own and they were not so bad, but definitely chewy. Add the additional cooktime from the French toast part, and they came out really gummy. I blame it on the banana. I spent some time discussing the execution of these pancakes with my brother-in-law. I think that a fluffier base pancake, maybe like the ricotta pancakes, left out over night and then French toasted would have worked out better. My BIL thought that the pancake flop was due to the inherent structural differences between French toast and bread…perhaps. He suggested barely cooking the pancakes the first time (so over really high heat, but for a very short period of time), French toasting them, and then cooking them more thoroughly the second time so that the pancakes spent less time just sitting in the pan. Another possibility. Oh well, let me know if you try these pancakes or any of my hypotheses! When I was little, I loved eating apples. Then, around middle school, I developed a food sensitivity to raw apples – it was just the worst. If I ate raw apple, my throat would get super itchy, and my tongue and lips would swell. Last fall, I decided to conquer my apple sensitivity. Armed with a bushel of freshly picked apples, I ate about 5-a-day for two weeks, and by the end of the second week, I was cured! 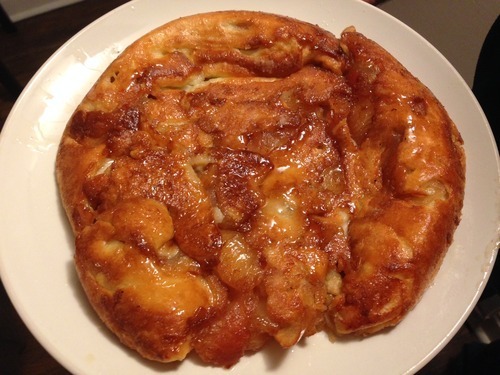 In honor of my reconciliation with apples, I set out to look for an apple pancake recipe. 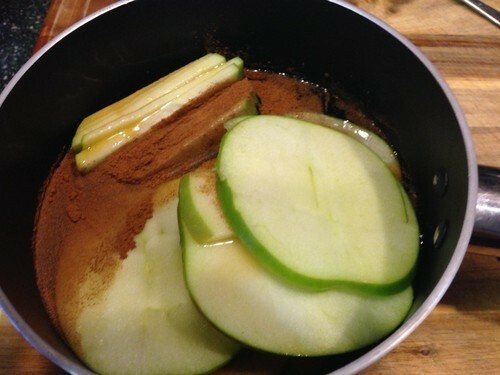 I wanted something that would mimic latkes, but much more apple-y, I finally found this one at Smitten Kitchen. (Get my version here!). Unfortunately, these weren’t exactly what I was hoping for, but I think with a little bit of tweaking, they could be grrreat! My main issue was with the texture of the pancakes. Even though the apples retain some of their crunch, the batter part of the pancake is really soft, and it gets pretty mushy on the inside. I couldn’t get the inside to cook more, without burning the outside. When I’ve made latkes, I always try to squeeze as much liquid out of the potatoes as I can by putting them in some cheesecloth and squeezing till I’m blue. I think the apples should be treated similarly because all the apple juice from grating the apples definitely upped the soggy factor. 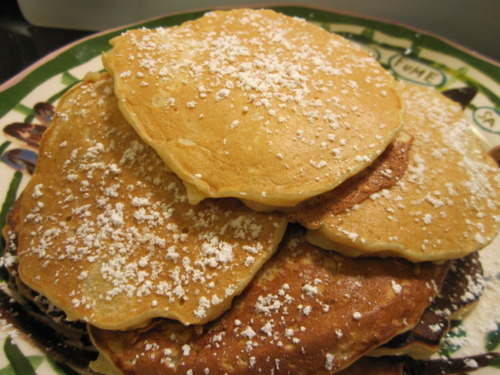 In Smitten’s post, she mentions that extra flavoring (like vanilla or lemon zest) would have kicked up her pancakes. 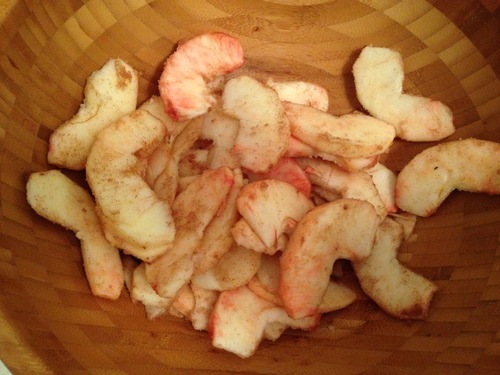 I went with some lemon zest in mine, and it was a little overwhelming for the apples, almost cleaning fluid-esque. 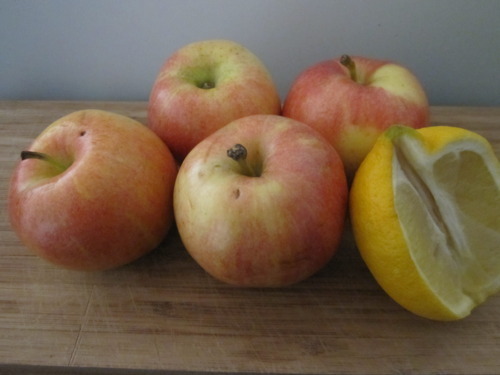 I think next time I’ll use tarter apples (maybe granny smiths) and add some orange zest (for sweetness). I had some pancakes left over that I ate next day, the flavor was basically the same, but they were super soggy (even soggier than the day before).